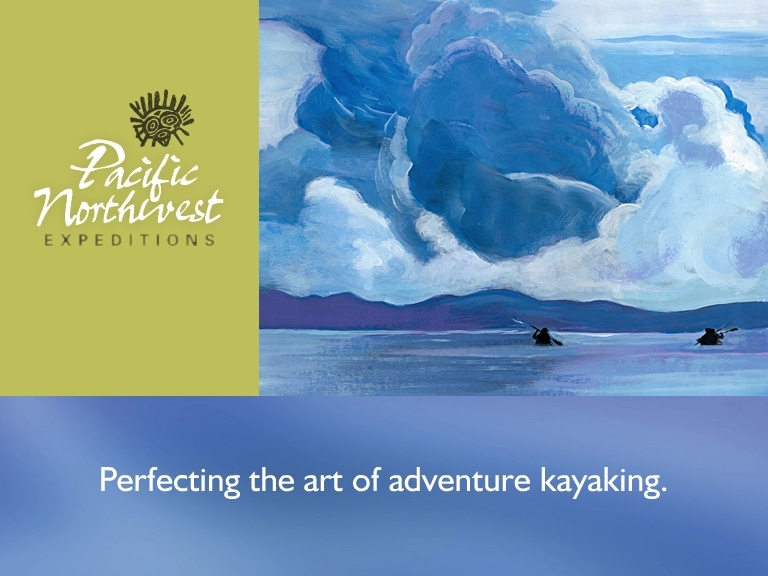 Pacific Northwest Expeditions is dedicated to creating unique sea kayaking experiences and vacations for the discerning traveller on Vancouver Island, British Columbia. Join us for sea kayaking with killer whales, wilderness sea kayak touring, and lodge based sea kayaking tours and adventures. Pacific Northwest Expeditions is a Vancouver Island based sea kayaking outfitter and we look forward to sharing our passion for sea kayak touring and wildlife viewing with you. When explored by sea kayak, the waterways of Vancouver Island, British Columbia, offers unsurpassed sea kayaking experiences, adventure, and natural beauty! Sea kayaking with Killer Whales in Johnstone Strait, British Columbia, world renowned as the best location in North America to view wild Orca whales. Choose from our Sea Kayaking with Killer Whales 4-Day Trip, or the Sea Kayaking with Killer Whales 6-Day Expeditions. The Robson Bight Ecological Reserve is the world's first sanctuary for killer whales, and is located within the core trip area of our Sea Kayaking with Killer Whales tours. Experience the thrill of whale watching wild Orca whales from your kayak! Sea kayaking with killer whales, Vancouver Island, British Columbia. Pacific Northwest Sea Kayak Expeditions offers lodge-based sea kayaking vacation packages. We are excited to be offering our Clayoquot Sound Lodge-based Sea Kayaking Adventure taking you into the heart of Clayoquot Sound, Vancouver Island British Columbia where creature comforts of a rustic wilderness lodge, combine with the excitement of sea kayak touring on the western shore of Vancouver Island. Explore by sea kayak the secluded western shores of Vancouver Island at Clayoquot Sound, or the Broken Group Islands in Barkley Sound. These wilderness camping sea kayak adventures will take you to places of sandy beaches, temperate rainforest and rugged islets off the west coast of Vancouver Island. The temperate North Gulf Islands situated of the southeastern end of Vancouver Island, provide endless sea kayak touring opportunities. These Islands lie in the rain-shadow of Vancouver Island enjoying the mildest climate along coastal British Columbia. The Gulf Islands offer stunning scenery and is an excellent choice for a 3-day sea kayaking adventure. Visit our website at www.seakayakbc.com to explore the exciting world of sea kayak touring adventure in British Columbia! British Columbia Sea Kayaking Trips: Pacific Northwest Expeditions offers British Columbia kayaking tours from Vancouver Island, BC Canada. Now in our 16th year, Pacific Northwest Expeditions has helped set the standards for British Columbia kayaking touring vacations and sea kayaking holidays. Our multi-day sea kayaking trips are ideal for active singles, couples and families. Sea kayaking holiday tours depart from Vancouver Island locations at Telegraph Cove, Tofino, Ucluelet, and Nanaimo. Join professional sea kayak guides for sea kayaking with killer whales, lodge based sea kayak vacation tours, and sea kayaking adventures. Discover Vancouver Island's best paddling and wildlife viewing destinations with Pacific Northwest Expeditions, perfecting the art of adventure kayaking!